35th match of ICC Worldcup 2015 has been played between Scotland and Sri Lanka at Bellerive Oval, Hobart today. Sri Lanka having won the toss, continued with consecutive 4th worldcup 2015 century ton of KC Sangakkara's 124 runs and TM Dilshan's 104 runs managed to put very huge totals of 363 runs for Scotland to achieved. Team Scotland all outscoring 215 runs in 43.1 overs and lost the match by huge margins of 148 runs. 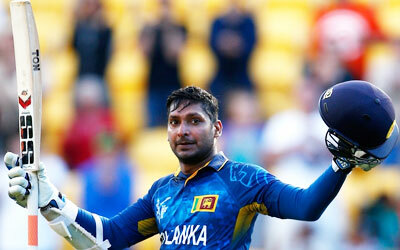 KC Sangakkara daclared man of the match for his 124 runs. Earlier, Sri Lanka won the toss and decided to bat first. Opting to bat first, Sri Lanka lost HDRL Thirimanne early scoring just 4 runs. KC Sangakkara joined with TM Dilshan and once again played recor breaking inning of 124 runs. He becames the 1st cricketer to score 4 consecutive centuries in 4 innings of worldcup and ODI histor. TM Dilshan also made 104 runs. Both added 194 runs partnership for Sri Lanka. In middle and lated overs skipper AD Mathews also played quick inning of 51 runs just in 20 balls and put Sri Lanka on very huge score of 363 runs at the end of 50 overs. Following target of 364 runs, Scorland lost opening batsmen early on team score 26 runs. Middle order bastmen PL Mommsen and FRJ Coleman played good cricket and contributed 60 and 70 runs respectively. Other lower batsmen could not stood in middle for long and team Scotland all out scoring 215 runs and lost the match by 148 runs.